Guys, I love to blog! Really I do. If I had all the time in the world I would spend so much more creating in this little space. I love what this blog has become for myself, it’s a wonderful journal of my life. I love what it has done for others, becoming a sweet little community of sorts! So many of you have been following along her for a long time! I want you to know how much I appreciate it. I see the people who are always liking my posts, or taking the time to comment. It makes my day and makes me want to continue on, open up even more, and just share more of my life with you! Please don’t ever hesitate to comment, send me a message, like a post, or share any that resonate with you. It truly is a huge reason I keep blogging! I know that there are so many different ways that you guys are alerted when I publish a new post.I have the entire month of November (weekdays) already scheduled with new posts! So there is a lot more coming your way! Today I just wanted to quickly share with you some ways you can stay connected to Everyday Smith! Everyday Smith has a Facebook page where my posts are automatically shared as soon as they are published on my site (Monday-Friday 7am central). This is not my personal facebook page it is solely created for my blog. I plan to start using it more, and sharing some special content only on that page in the future. So if you want to follow along click the link above and “like” my page! Everyday Smith also has an Instagram account! This is my personal account, but I also share some blog stuff there as well. I love Instagram, and you will find a lot of pictures and stories on there that are not published on the blog. It is really one of the best ways to keep up with me. I use it a whole lot! Bloglovin’ is an awesome site if you follow multiple blogs. It is a free account where you can select all the blogs you read and each day you will find the newest posts from the sites you follow. I use the app on my phone which is great! I just click on it and all the newest posts from the blogs I choose to follow show up and I can read them right there! Create an account and search Everyday Smith, you’ll find my blog and you can add it to your page to follow! Did you know you can sign up to get emails straight to your inbox when a new post goes live? It’s true! Just click the blue “Follow Along” button on the sidebar and it will get you set up! Everyday Smith actually has a twitter account! I’ll be honest, I never look at it or use it manually. I do however have it set up to automatically share my latest blog posts! So if you use twitter often, it’s a great way to follow along! If you have any questions about how to use any of these avenues to follow Everyday Smith, let me know! I am happy to help! Again I want to thank you all so much for reading and supporting my little hobby! I love hearing from you and knowing you follow along! Keep up the commenting, liking, and sharing! It means so much! 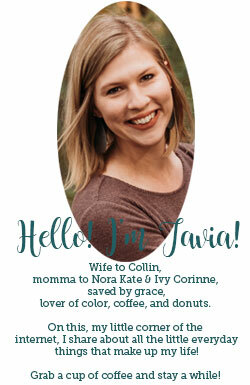 I love your blog, Tavia! I toyed with doing one myself a few months ago, but couldn’t think of a name so dropped it. I only wanted to talk about the books I read and maybe share some spiritual stuff. If God wants me to do it, He will show me.